Quanuntum Petshop is making a documentary about growing giant pumpkins and you can help support or efforts by buying some of Bill's seeds. Site; select a sunny area or one with very little shade that is about 20x20 for each plant. Add a garden fertilizer (10-10-10) or compost and till. Protection; if your patch is in the open it is important to provide wind protection for the seedlings. Something a foot high on all four sides for several weeks. Once the vines start to grow take your shovel and put soil over the top of the vines to hold them down. Pollination; will begin in July and we will let the bees do the work. 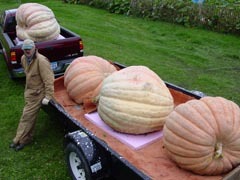 Pumpkin selection; the fewer the pumpkins on the plant the bigger they will grow. Let three pumpkins start growing and then select the one that is most perpendicular to the vine and remove the other two. Keep removing all other pumpkins. Pruning; the vines will grow 40 to 50 ft so you need to prune them by just pinching off the end when they reach the edge of your patch. Pumpkin care; this is a very important step to eliminate broken stems by allowing the vine to move as the pumpkin grows. On both sides of the pumpkin stem where it attaches to the vine, cut the roots under the vine at the leaf nodes for several feet. Basic gardening; water regularly, keep weeds at a minimum and watch for pest and other problems. Harvest: expect to harvest the pumpkin in October. A pumpkin plant will reach maturity in around 80 days. Good Luck and support. I wish you good luck, if you want to ask me any questions, I'm in the phone book.